If you are anything like me I don't really enjoy making cookies due to the fact that it seems to NEVER end! batch after batch! I'm way over the fun of it after the first or second batch pops into the oven! 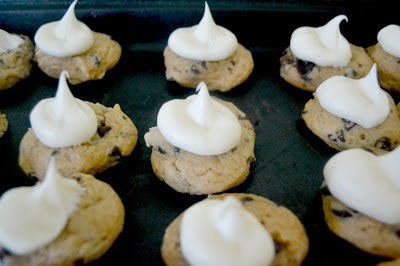 I do find a need to make cookies once in a while so keeping the process as speedy as possible is my goal. My favorite way to streamline the cookie baking process is to use an empty cereal liner bag to plop the cookie dough onto the baking pans. It works perfectly for those doughs that are super moist, almost cake like that don't roll into balls, like this 2 ingredient (ok 3 I added chocolate chips!) pumpkin cookies. It really speeds up the baking process. Jan's Tip: It can be done with thicker dough but is a little harder to squeeze out, but can be easily done. You can then roll them into perfect balls if needed depending on the cookies. 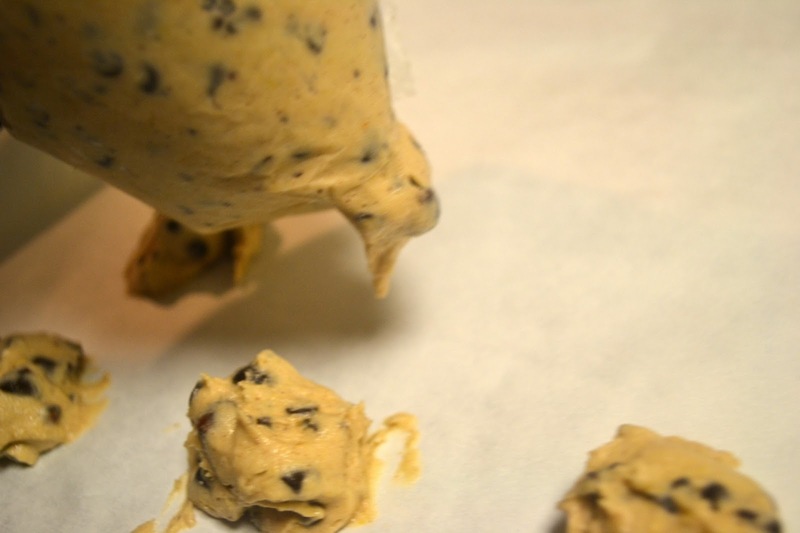 With one person squeezing out the dough and the other rolling you'll get a ton baked in no time. 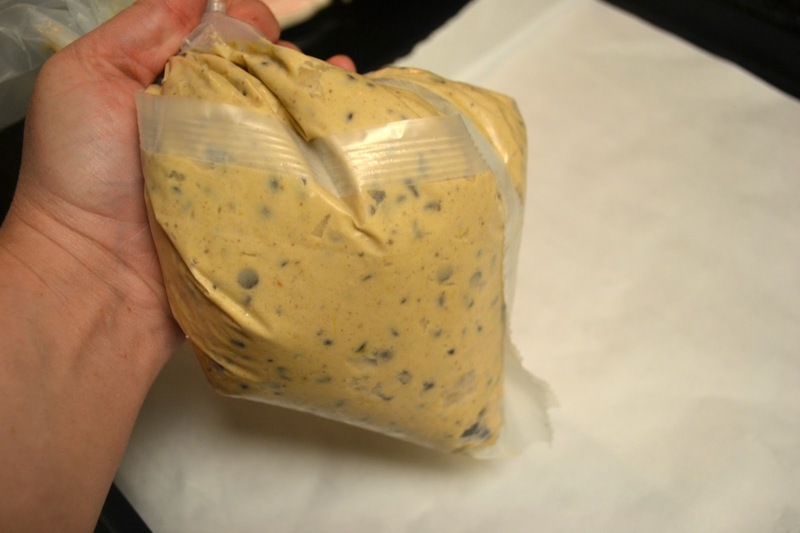 Load your cookie dough into a clean, empty wax paper cereal bag, loading the dough into one corner of the bag. Twist the top of the bag several times. Snip off the corner of the bag. How much to snip off depends on the amount of dough you want coming out to dispense. I shipped about 1 inch off the corner. 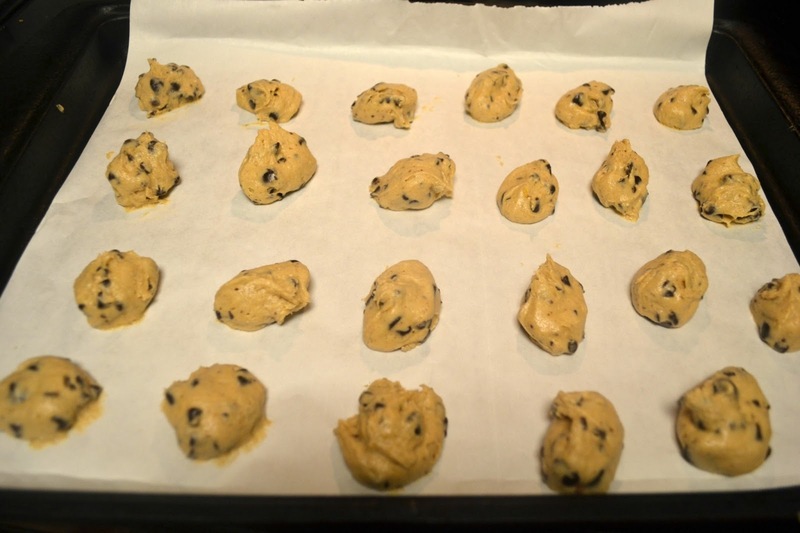 On your prepared (lightly greased or lined with parchment paper) baking pan, slowly squeeze out a dollop of cookie dough into desired size. Mine were small bite sized cookies and so I dispensed about a 1 1/2 inch dollop. spacing apart as you normally would. Bake cookies according to recipe. To finish mine off I used a store bought can of cream cheese frosting and used another cereal bag to squeeze a small kiss of frosting on top of each one.